In order to direct resources and energy appropriately it is necessary to describe the nature of cross border trade activity and to examine the details of its operations. 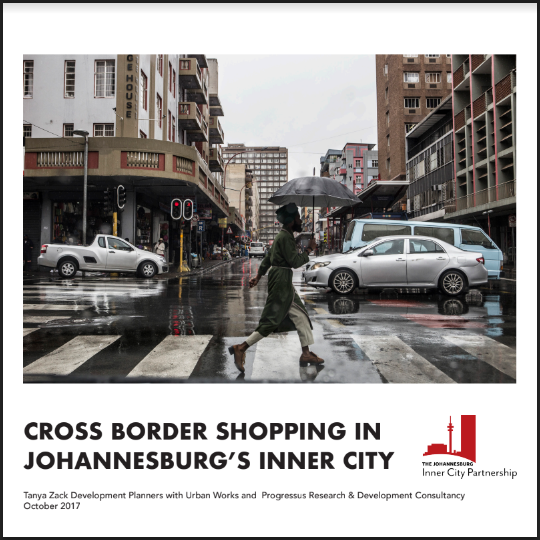 The Cross Border Shopping Research, examines the nature of cross border trade in the inner city of Johannesburg. The study maps the centre of cross border shopping, the goods purchased and the density of affected trade in the inner city. It provides an indication of the contribution of cross border trade to the economy of the inner city. And it scopes the critical factors that contribute to or threaten the successful operation of cross border trade in inner city of Johannesburg. The study offers recommendations for appropriate responses from state authorities to these challenges and opportunities. In the coming year the JICP will produce a hard copy research report. In addition, the JICP will continue to engage in debate and to foster interest regarding cross-border retail activity within the Inner-City. The organisation will share the information from this research in the interest of promoting the sector and influencing debates and perceptions. The Cross Border Shopping Research was conducted by Tanya Zack Development Planners with Urban Works and Progressus Research & Development Consultancy. Funding for the research was provided by the Johannesburg Inner City Partnership, AFHCO, TUHF, Urban Task Force, JHC, Jozi Housing and a group of cross border shopping merchants.